by Tim Palgut. Titan, 96 pp mono, hardback with dustjacket. £19.99. ISBN 1-84023-597-7 Review by Lew Stringer. One pleasing aspect of the numerous Prisoner books being issued is their variety from each other. It's fair to say that there's practically a Prisoner book out there for every taste at present. This book is more likely to appeal to the fan who is more interested in the background of the fictional Village rather than reading about the actors or details on the show itself. Remember the Star Trek Technical Manuals? 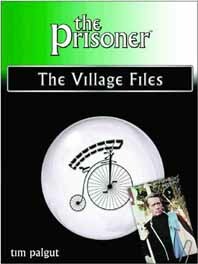 "The Prisoner: The Village Files" is in a similar vein, packed with numerous technical drawings, detailed schematics, and floor plans of the main structures and technology of the Village. The Village Files is presented as if it were an official secret document for Village operatives. In effect you, the reader, are the new Number Two perhaps, and this book is your briefing on the Village and, of course, its most stubborn resident, Number Six. The author/artist Tim Palgut has clearly studied the programme in great detail. Accurate floor plans of the Green Dome, Number Six's cottage, reproductions of badges (even including the point size for the numbers!) etc prove his dedication. Palgut has also taken some liberties of his own, and expanded upon what the series presented us with. Diehards will either be annoyed by this, or accept it in the way its intended; as a bit of fun, not to be taken too seriously. For example, the author invents a not very convincing acronym out of Rover (Reactive Orange-alert Visual EnforceR) and has the Illuminati as "the plenipotentiary force in the Village". There is a connection between Danger Man and The Prisoner established, but with an interesting twist. The book is professionally designed, with pin-sharp computer generated artwork throughout. However, Titan's decision to produce the volume as a hardback has neccesitated a £19.99 cover price, which seems a bit high for such a light-hearted publication. Nevertheless, if this sounds like the kind of book for you then you'll consider it money well spent. Click HERE to visit Tim Palgut's own website and to see preview pages from the book.